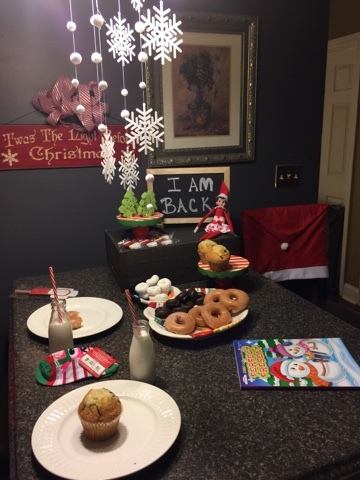 Several weeks ago our Elf On The Shelf Isabella magically appeared with a "I Am Back Breakfast". Some families call this a North Pole Breakfast or a Welcome Back Party, I prefer my slogan better. 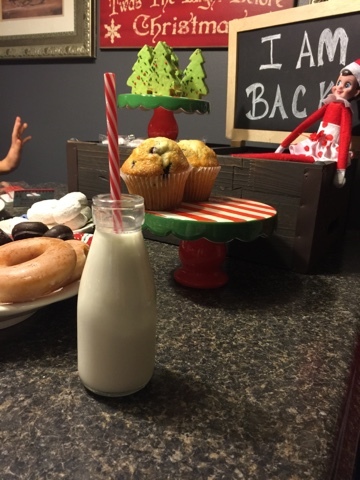 Secretly I prepped my kitchen for this secret breakfast that our Elf was bringing. I secretly bought all the breakfast goodies, and the small cheap gifts. I made sure my kitchen was decorated in our Christmas decor. Then I waited patiently for my children to go to bed. I did not do anything over the top for this party. Some families make this party really big with pancakes and all the fixings, and tons of decorations. I wanted this breakfast to be simple and easy on me. 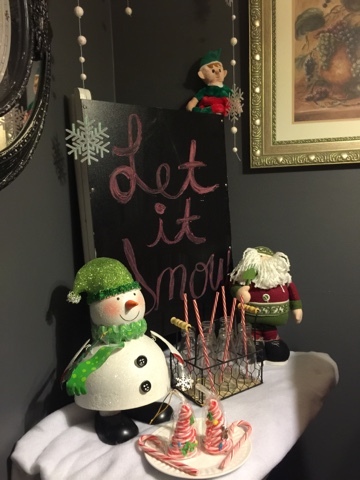 To start the decorations I made sure I wrote "I Am Back" on the chalk board. I served foods I knew my children would eat. Oops..I mean our Elf Isabella served us food that she knew we would eat. We had Krispy Kreme donuts, white powder donuts, chocolate donuts, blueberry muffins, Little Debbie Santa brownies, and Little Debbie Christmas trees. Our Elf Isabella placed the food which was still in their containers on the places where she wanted each item to be. I guess that was a hint that she wanted the food to stay fresh until everyone got up and for me to take the food out of the containers and put them in their place when I got up. My children did not mind that at all and did not think anything about it. Our Elf did take the trees out of their bags so they would be standing. I thought this was a good idea because we were able to put the left overs back into their containers and the children did not question it. I have to watch every thing I do because my daughter is questioning Santa. Milk was poured in the glasses when we were all at the table. I can not stand room temperature milk. The glasses were new and my kiddos had never seen them before. We all thought they were cool. I love those trees. Isabella the Elf brought so much stuff she had to have helpers. We had to examine the different looking elves. I had to think fast on my feet and say those elves are warehouse elves and that is why they are different. My daughter took that and ran with it. By the end of our breakfast we had named the elves, Jordan and Issiac. Our guests stayed with us for the day then they went home. 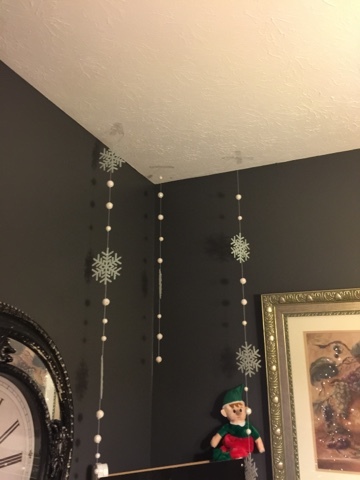 Did you see the snow and snow flakes decorations? I am in love with them. 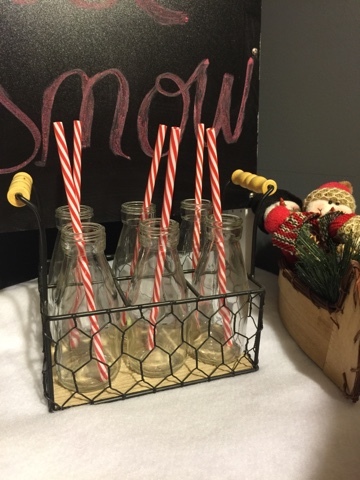 Candy canes were brought as small gifts. 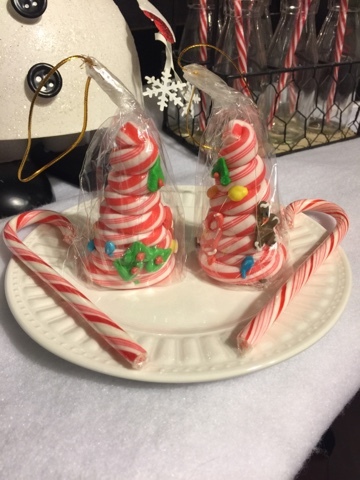 The two in the middle are edible ornaments. These are my new milk jug glasses!! I think they helped make the party fantastic. I love how my small table turned out. 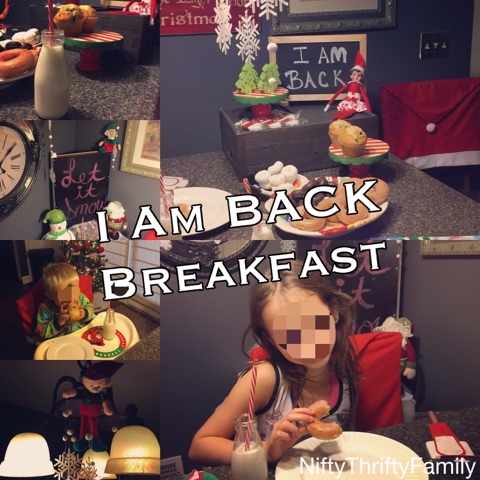 My children had a wonderful time at our "I Am Back" breakfast. 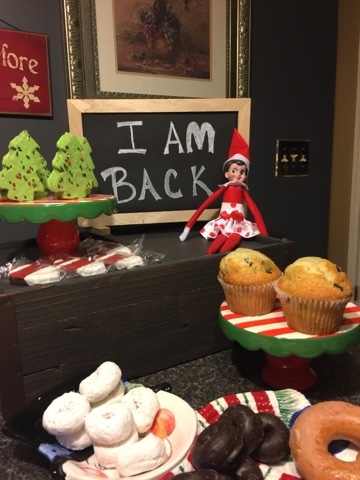 My daughter went to school the next day and told all of her friends that her Elf On The Shelf Isabella brought us all this free food for breakfast and told all her friends about the helpers. I am one happy mommy. 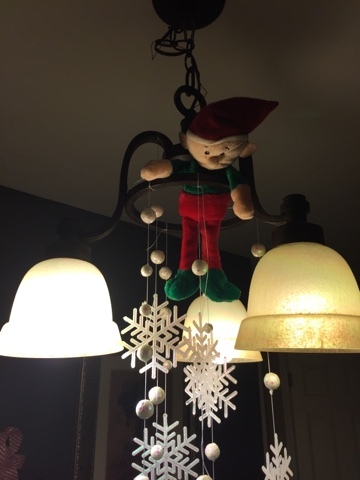 Have you done a Elf On The Shelf Party? If you have I would love to see it and I would love to showcase your party.